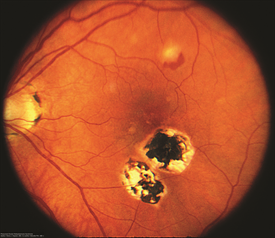 Presumed Ocular Histoplasmosis Syndrome (POHS) causes atrophy (wasting) around the optic nerve and multiple scars, called histo spots, in the choroid. These symptoms are accompanied by new blood vessel growth (neovascularization) that starts adjacent to a histo spot. Histo spots (Figure 1) are considered the earliest stage of the disease. Less than 5% of individuals with histo spots will develop neovasculization in the central macula (at the middle of the retina). Because the histo spots themselves usually do not cause symptoms, patients typically do not develop symptoms until neovascularization grows in the central macula. Symptoms include painless progressive blurring of central vision and wavy vision (metamorphosia), which can be sudden or develop slowly. Histoplasmosis is a disease caused by Histoplasma capsulatum (H. capsulatum), a soil fungus prevalent in certain parts of the American continent, in particular the Ohio and Mississippi River valleys. POHS has also been found to be prevalent in the same areas where 60% of the adult population is estimated to react positively to histoplasmin skin testing and 2% show the typical signs of focal chorioretinal scars in the eye. Consequently, it is thought that H. capsulatum enters the eye from the bloodstream, invading the choroidal vessels and ultimately causing scarring. However, it has never been directly proven that H. capsulatum causes POHS, hence the name presumed ocular histoplasmosis syndrome. The vast majority of patients with POHS have no known history of systemic infection. One theory is that when childhood infection with H. capsulatum occurs, the fungus spreads through the bloodstream to the eye and choroid, where scars form and remain long after the systemic infection subsides. The histoplasmosis infection usually does not cause symptoms throughout the body, so most people never realize they have histoplasmosis scars, or histo spots, in their retina. The scars can later lead to neovascularization in the macula resulting in visual loss. This occurs most frequently in the second to fifth decade of life. These patients may have a history of childhood exposure to chickens. This happens as often in males as in females and it is predominantly found in the Caucasian population. Ocular coherence tomography (OCT) and fluorescein angiography (FA) are performed to evaluate for neovascularization in patients who visit their doctor with symptoms of visual loss (Figure 2). Figure 1. Color fundus photograph of the right eye of a patient with POHS shows typical punched out scars and peripapillary atrophy. Henry Kaplan, MD. Presumed Ocular Histoplasmosis Syndrome. Retina Image Bank 2013; Image 4951. © the American Society of Retina Specialists. Figure 2. John S. King, MD. Presumed Ocular Histoplasmosis Syndrome. 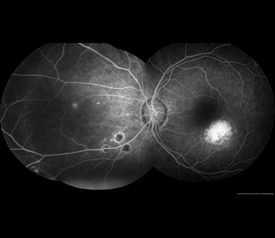 Retina Image Bank 2012; Image 421.© the American Society of Retina Specialists. Treatment is generally required only when there is neovascularization. Given that H. capsulatum does not seem to play a direct role in the development of POHS, antifungal agents are not used to treat POHS. However, injections of medications that inhibit neovascularization are recommended. These medications include bevacizumab (Avastin® ), ranibizumab (Lucentis® ) and aflibercept (Eylea® ). Prior to injection, the eye is given an anesthetic drop or gel and is cleaned with povidone iodine; the injection generally causes minimal, if any, pain. Injections are initially administered monthly until the neovacularization improves, as confirmed by OCT or FA. If neovascularization is treated early, before advanced scarring develops in the central macula, the prognosis for vision is generally good.